LANSING — Michigan Attorney General Bill Schuette recently signed onto a court filing that questions the scientific consensus about the causes of climate change. “The debate concerning the scope and sources of climate change (is) still raging in scientific and public circles,” according to the Aug. 10 amicus brief from Schuette and 11 other Republican state attorneys general and governors seeking to advance the energy giant's arguments. Traverse City has pledged to fight climate change through clean energy. Can your city? “In the climate science community, there’s no longer any serious debate that humans are changing the climate and are causing the vast majority of warming and other associated changes through the emission of greenhouse gases — primarily through the burning of fossil fuels,” Jonathan Overpeck, an interdisciplinary climate scientist and dean of the School for Environment and Sustainability at the University of Michigan, told Bridge Magazine. The filing in the U.S. Court of Appeals was written by Texas Attorney General Ken Paxton and seeks to quash a probe into whether ExxonMobil broke laws by publicly downplaying the climate risks of burning oil and gas. The filing backs Exxon's lawsuit to block a demand by attorneys general in Massachusetts and New York for decades of internal records related to the company’s understanding of climate change. Schuette is the Republican nominee for governor. Andrea Bitely, a spokeswoman for the attorney general, did not directly respond to questions from Bridge Magazine about whether Schuette agrees with the filing’s claims on climate change. “The Attorney General signed on to the amicus brief you referenced for one reason: to preserve the right to free speech, on the topic of climate change or any other,” she told Bridge in a statement. "I understand the significance of global climate challenges and the responsibility that both developed countries and new, emerging economies have to lower [carbon dioxide] emissions. And, etched in the DNA of every Michiganian is the recognition of wise stewardship and conservation of our natural resources." The email touted Schuette's actions on several environmental issues unrelated to carbon dioxide emissions. 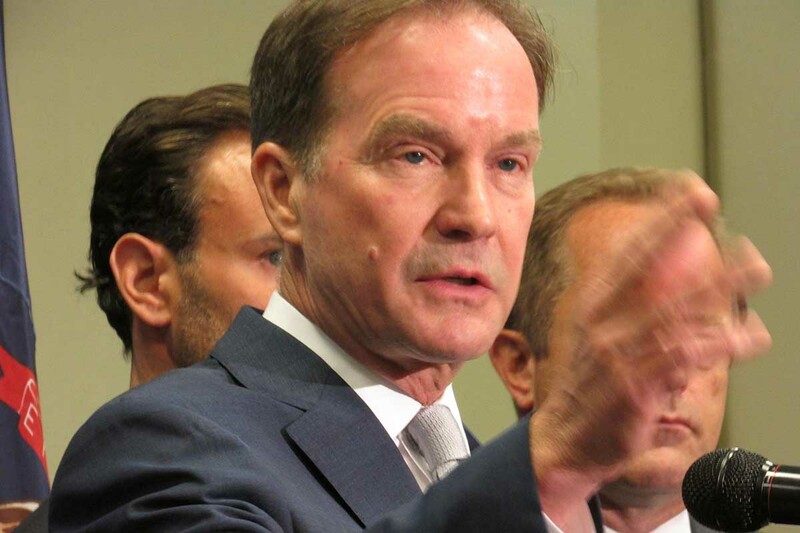 "I have fought to protect the environment in my opposition to Great Lakes Water diversion, opposition to changing ballast water discharge standards, fighting to stop Asian carp migration to the Great Lakes and encouragement of the building of a utility corridor/tunnel to replace the aging Line 5 pipeline," Schuette said. The Democratic attorneys general are investigating whether ExxonMobil violated consumer protection and securities laws by downplaying climate risks — to the public and shareholders — even as internal scientists warned company executives of the consequences of burning fossil fuels and published research about the topic. The investigation piggybacks on a series of reports by the Los Angeles Times, Inside Climate News and other outlets revealing inconsistencies dating to the 1970s in the ways the ExxonMobil discussed climate change inside and outside its Texas headquarters. In their brief supporting the company, Schuette and his colleagues seek to dismiss the probe on free speech grounds. “The New York and Massachusetts Attorneys General falsely presume that the scientific debate about climate change is settled, along with the related and equally important debate on how to respond to what science has found.” the brief states. The Republican governors and attorneys general — including Schuette — made an identical assertion about climate science being unsettled in an April brief in the case, which has not previously drawn attention in Michigan. This isn’t the first time Schuette has waded into a legal battle concerning climate change. Breaking with Gov. Rick Snyder, he also joined other states in fighting Obama’s “Clean Power Plan” — regulations to speed states’ shift from coal-fired power in an effort to reduce carbon dioxide emissions. He argued the regulations were too onerous and would increase electricity prices. The U.S. Supreme Court stayed those rules in 2016, and President Donald Trump’s administration has since scrapped the effort. Denial is such a cynical, political move. I see the changes in the invasive species, the invasion of insect pests and noxious weeds that we've never had before, and so does everyone else. I plant a little earlier now because I know the growing season ends earlier now, and we will have rainy seasons earlier and longer. Meanwhile, Bill Schuette spends my tax dollars on court cases designed to permit the increase of pollution and the likelihood of dangerous spills. No vote for you, Bill. There is no freedom of speech for created corporate entities, only freedom of speech for natural born citizens of the United States of America. With the earth millions of years old, I find it hard to look at a 50 year trend as anything more than a statistical blip in the climate data. That said, we should do everything we can to avoid polluting the environment, be it from atomic elements that will not decay for thousands of years, or carbon monoxide from burning fuel, or elimination of rain forests which act as a buffer for the environment. We should do everything possible to come up with more efficient sources of energy (wind, solar), and more efficient uses of this energy (led bulbs, energy efficient electronics). When I see the composition of the strata of mountains in areas next to the oceans, we had, hundreds of thousands of years ago, sea levels that were 500 to 800 feet higher than they are today. We had temperatures that were much higher than what we have today, and in different times (think ice age) much lower than they are today. One hundred years is just a blip in the timeline, not a defining moment. Our problem is that mankind wants to maintain the timeline where it is today, and in the context of thousands of years, that is not possible. I'm always amazed how people (Republicans almost exclusively) can ignore the overwhelming science on this topic. Paper after paper, rigorous peer review and now our own eyes and 98% of the scientists in agreement yet just denial from some. '50 year trend' - highest temperatures in centuries. You're right I don't vaccinate. But to say climate change is a done deal shows your ignorance. They changed the name to climate change for a reason. Climate warming has been debunked over and over. The Nasa papers you are talking about have been debunked as they have been tweaked to get the answers that they want not the truth. Climate change is real as it has been changing for millions of years. And my political association has nothing to do with the truth. The problem with you is you can't handle the truth. The comment posted a paper. You stated the papers were debunked. Please post the papers that debunked the paper that was posted. I am interested in reading all of it (I have read dozens of papers on the topic) to stay informed, if the papers are legit that is. You are forgetting one undeniable fact: This 50 -year or 100-year global warming trend that you say is a mere "statistical blimp", only shows that you do not, or refuse to, understand the proven importance of this "blimp". Scientist have proven: During this unprecedented very short time period, the direct cause of our planet's continued climate change, its steady rise global temperature, is the burning of fossil fuels. Period!! Call it global warming, or climate change, it makes no difference. Like all other folks, including our Republican law makers, who conveniently and comfortably twist and delude the reality of facts, you like your head stuck in the sands of ignorance. 98% of Govt funded scientists. Him? What do you suppose would happen to their funding if they did oppose? Seems as though in the 1992 Al Gore scare message we would see drastic changes in 20 years. I have to go home and mow my lawn because of August rains. Oh wait I can’t, it’s a ozone action day. You know what would happen if someone could disprove climate change? They be famous and wealthy overnight. That's how science works. Science continually tries to prove their own theories wrong. That's the scientific method. You should try it, you wouldn't be so ignorant. 30 year trend in climate science is what is considered a trend. In the last 30 years, the earth has clearly warmed. That trend is clear. This last 30 years is warmer than the previous 30 years to that. The question is, "What caused the last 60 years of warming." The only factor that is even warming is the human influence in the atmosphere. That is a true statement. No matter what the rebuttal to this statement, there is no evidence on the doubters side that can refute this. Your sad comment proves that you refuse to accept, or remotely understand, the proven facts. Typical republican comeback. So what's the surprise? The Republican Party is in the pocket of Corporate America - and that's why they like to appoint judges schooled by the Federalist Society, the training ground for pro-corporate activist judges. The concept of Free Speech is an equalizer for all American citizens. Corporations are NOT people, they are institutions granted existence by the State and can therefore (and MUST be) regulated by that State. Exxon Mobel is using the Philip Morris playbook of knowingly keeping any negative findings about their product from the population at large by claiming the the Free Speech right to not speak. I'm sure that if Schuette received enormous campaign donations from all the environmental groups, he'd sing a different tune. And that would be equally as wrong as his indebtedness to out-of-state corporations trying to buy his influence. How can one serve the people of Michigan when one receives the lion's share of their campaign funds from deep pocketed organizations not incorporated or located in Michigan? Well said Richard. Climate change does not contribute to the overwhelming increase in Asthma right? Climate change does not account for the change in weather patterns and global warming right? The devastation and disasters that these oil companies have been responsible for over these many years including oil spills in major bodies of water is tragic, and yet Bill Schuette stands there with fingers in his ears, shouting la, la, la, la, la., and accepting campaign funding from these same companies. This is the Republican playbook, and they are in the pocket of corporate America. VERY SAD!! Mr. Schuette is amazingly in the dark on this topic. Stick to attempting to win the governorship! Amongst scientists, the OVERWHELMING conscience is the planet is warming! Only scientists tied to the big businesses where they get their paychecks from, side with the idea the planet "May or May not" be warming! The public may also be "raging" on this, who cares, but the overwhelming majority of the scientific community is not!!!! The Union of Concerned Scientists (a planet wide body) has repeatedly & overwhelmingly stated that climate change is happening and at a very accelerated rate. We can continue on our present path, for sure, but the results of this stupidity will leave our children, grandchildren and great grandchildren (maybe?) with an unsolvable mess!! We on the other hand will get to continue to watch more extreme storms (good for days of media coverage), more amazing 100 year catastrophes EVERY year, all time record breaking fires, and many more media weather events! Stick to what you know Bill! Anyone check yet how much the fossil fuel industry has donated to Billy? I have not YET. that this guy is running for AG is saddening. With each passing year the extremes get ever more extreme, a treaty signed all but one nation is not consensus enough??? I hope MI voters reject the nonsense! It's worse....he actually thinks he can be governor! Schuette is dishonest and deserves to be voted down for this. Pursue whatever policy you want but don't play with facts. This is settled science; EXXON Mobil has even admitted to the truth of climate change. Climate scientist world-over have published independent verifiable proof that our planet's accelerated climate change is directly related to mankind's burning fossil fuels. Yet Republicans, like MI attorney general Bill Schuette, skillfully twist, delude, and skirt around its reason and reality. Making matters worse, he is joined by countless other Republican lawmakers who only embolden the fossil fuel giants, like ExxonMobile, to employ comfortable long-winded stall tactics in taking immediate bold steps to help reduce, and eventually halt, humankind's CO2 footprint. "Last month, the Michigan attorney general signed a court filing in support of energy giant that claims debate about global warming is still ‘raging’ among scientists. Spoiler alert: It’s not. " Using the tried-and-true IPCC as the gold standard in telling us about what will happen decades from now, when weather forecasting cannot even accurately tell us what the weather will be like a few days, much less a week from now. Say, didn't they get hacked a few years ago and have a lot of damning e-mails released to the public regarding their so-called methodology and ultimate political goals (cough, cough Climategate)? "Can you delete any emails you may have had with Keith [Briffa] re AR4? Keith will do likewise. Can you also email Gene [Eugene Wahl, a paleoclimatologist at the National Centre for Atmospheric Research in Boulder, Colorado] and get him to do the same … we will be getting Caspar [Ammann also from NCAR] to do the same." And these are the "experts" that Mr. Malewitz cites for "global warming". I'm not even a supporter of Bill Schuette, but even I can see what a cheap shot this is to bring up the "global warming" boogeyman in the days leading up to the election on a non-news story. Do you realize that you are equating weather with climate?? Doing so is nothing more that a convenient tactic of rejecting reality, commonly used by republican law makers, and science deniers, such as yourself. Just another way to blindly kick the can down the road. Science is based upon observation and experimentation, which eventually led to laws that ultimately allowed other to experiment and/or, calculate in order to consistent reproduce their results. Those laws come into play when I turn on the kitchen faucet, to starting up my truck, to making a post like this on my phone. The anthropomorphic global warming-crowd (remember when you used to call yourselves that) isn't exactly batting 1000 when it comes to the reproducability of their work. I happen to like living in 21st Century society. Since the AGW-crowd doesn't, please feel free to live in a tent in the woods somewhere, grow your own food, collect your own water at the local lake or river and swear off EVERY modern convenience, since according to your own hypothesis, to do otherwise only contributes to the problem. Drop us all an email on how well that works for you. Someday, maybe someday, certainly not soon enough, we will see an article that mentions human-caused climate change that doesn’t draw out so many that think they know more than climatologists. We certainly need more critical thought in our society, but not when it is clouded by ideologies, cherry-picked data, and logic fallacies. (see all examples in comments here). There is no question on the specific causes. We need to focus our discussion energy on mitigation of the risks, city/regional/infrastructure planning, and funding for dealing with what is coming (disaster relief strategies, increasing insurance costs, etc.). The only “blips” we need to ignore are those flat-earthers trying to stand in the way. History will judge them soon enough. Schuette knows nothing about science. He speaks for the fossil fuel lobby only. The only things unsettled in the scientific community are how high will temperatures go, how many of the most likely scenarios will come to pass... and will YOU personally die of other causes before the famine gets you? Ah, but will your children? Think about it. None of those things that Schuette boasts about environmentally have anything to do with air pollution and carbon dioxide emissions. The debate rages on only from the climate change deniers. When you dance with Trump, your brains turn to mush. One problem with tunnel vision is not seeing the universe surrounding just an itty-bitty spot. One tends to collide with all the stuff surrounding that tiny spot of vision. Likewise, disaster is surely in the offing if a government leader only sees his political dogma as holy gospel and discounts all facts save those confirming his comfort zone. Surely, former Kansas gov. Sam Brownback is a clear example of leadership by dogma gone insane. By stubbornly pursuing Republican "failed tax policy ideology” instead of “practical problem-solving” he led Kansas straight down the sewer to economic ruin. In supporting Exon/Mobil's climate change denying, Mr. Schuette expects us to accept his itty-bitty, tunnel vision view of the environmental disasters playing out before our eyes, while he panders to the predatory capitalists and squanders our irreplaceable life sustaining environment. Free speech is one thing. Defending the right of ExxonMobil to insist that 2+2=3.6 is another altogether. Let's see - the climate has been changing ever since the earth came about - certainly has been getting warmer since the last ice age. Scientists tell us that North America was sub-tropical when the Dinosaurs roamed and we haven't got back to that point yet since the ice age. A few years ago the media were telling us the Great Lakes were drying up just because the water level had fallen - even though it hadn't even got close to their historical lows. Media blamed the low water levels on all kinds of man made causes (dredging, etc.) funny - just like in times past the water levels climbed back up. Don't hear or read a thing about how wrong all these idiots were. Any one could have looked up historical water levels and realized this is just what happens. Common sense is pretty uncommon in this day and age! The Exxon brief is NOT Bill Schuette's biggest adverse environmental record liability in the matter of global warming and climate change. Schuette's biggest mortal sin against progress on climate change was his direct litigation effort on behalf of the State of Michigan against President Obama's EPA to oppose federal environmental rules to control greenhouse gas emissions under Section 111 of the Clean Air Act --- the Clean Power Plan, which would have the effect of decreasing coal combustion and increasing lower carbon fuels and wind/solar/nuclear. Federal Court litigation review of the Clean Power Plan is presently stayed in court pending a Trump EPA alternate proposal likely to not accomplish as much greenhouse gas reduction as what the Obama Administration had planned.